How do you keep track of liturgy planning from year to year? Are you digital, maybe using Excel or Word, or more analog, like using binders and file folders. Maybe you’re a sticky notes person with notes framing your computer monitor. It’s critical to keep track of liturgy planning details and beneficial to do it in a way that will save time from year to year. But what is the best way? 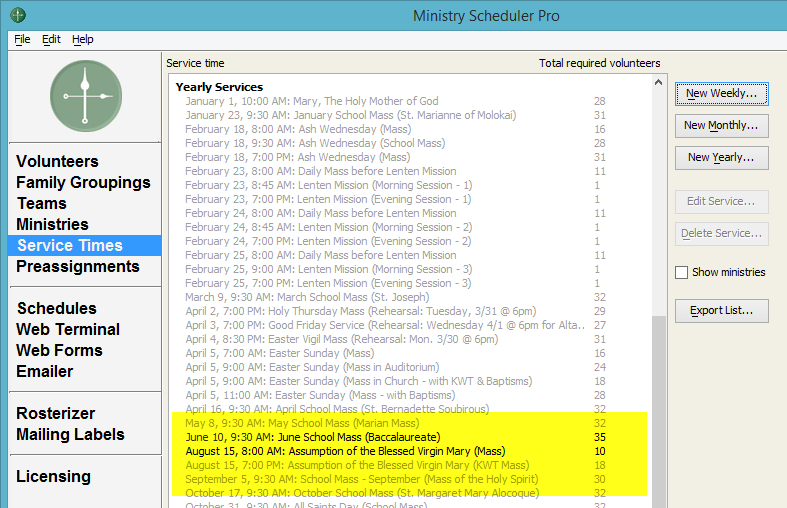 The whole “secret to my success” can be found in the service times screen in the Admin Panel of Ministry Scheduler Pro … specifically, the Yearly Services. 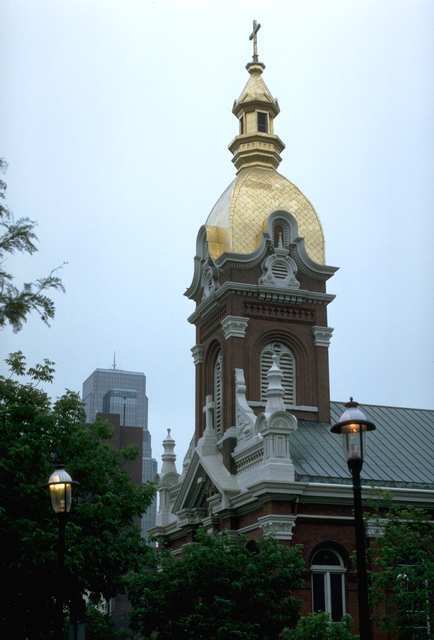 The routine weekly services are not what usually cause liturgical planners to lose sleep. When did you ever hear of a Sunday morning service falling between the cracks? It’s the yearly services, like school masses, holy days, holidays, para-liturgies, missions, liturgical rehearsals, etc., that sometimes catch us off-guard. These are not routine and so they take more of our attention because they are full of unique details that we either have to remember or track somehow. When you put them in a single list, it’s amazing how many there are! To a lot of people it’s just going to look like a long and, maybe, overwhelming list. To me, it’s pure Gold! It wasn’t created in a day … it evolved through a year of scheduling. It’s a list of every Mass, service, or event that meets my Golden Rule, which is: If someone has to be scheduled for it, it goes in the scheduling software. My solution for tracking these events was to leave them on this list of services and simply activate or de-activate as needed. Look at the two items not in light gray. It’s May as I record this and the next batch of schedules will cover the first part of Ordinary time, basically June, July, and August. Everything is deactivated except the 2 events that occur during the upcoming scheduling period. When we get ready to do the schedules for the 2nd part of Ordinary Time, September, October, and November, I already know what yearly services to plan for: a couple of school Masses and All Saints Day. My personal preference when I am looking at this list is to condense it to just service titles. But by checking the “Show Ministries” option, the list will expand to show the ministers needed for each service. And, if you really love having printed copies of information, use the EXPORT LIST button to create a printable document. If you’re in the condensed list view, that’s what you get in your document. Here you see the list of services with just the number of required ministers. If you had Ministries showing when you exported, that is what you’ll get in your Word Document. The service time with the breakdown of the ministries and how many ministers are needed for each one. These are really helpful documents to take to liturgy planning meetings. For me, it was especially helpful with scheduling the music department. Give this Yearly Services List idea a try if you’re looking for a way to reduce time spent on scheduling. After a year of running your schedules and creating this master list of services, I am certain you will see for yourself the time saved in liturgy planning.